Have you ever wondered who the best-performing Sellers in their respective categories are? Who’s turning around the largest number of projects a month while keeping their Buyers happy? Well, we did too! That’s why we created the new “Monthly Leaderboard” page! Every month, the earnings and feedback data will be gathered for every Seller. The top 10 performers in each category will appear on the page. Sellers can use the “Monthly Leaderboard” page to compare their activity against others’, see the progress they made compared to previous months, and engage in some friendly competition! Buyers will be able to see who the movers and shakers of each category are, browse their profiles and contact them to collaborate on various Projects! Every month the top 3 Sellers in each category will receive a badge which will be featured on their profile and will also be visible on the Freelancer listings page! 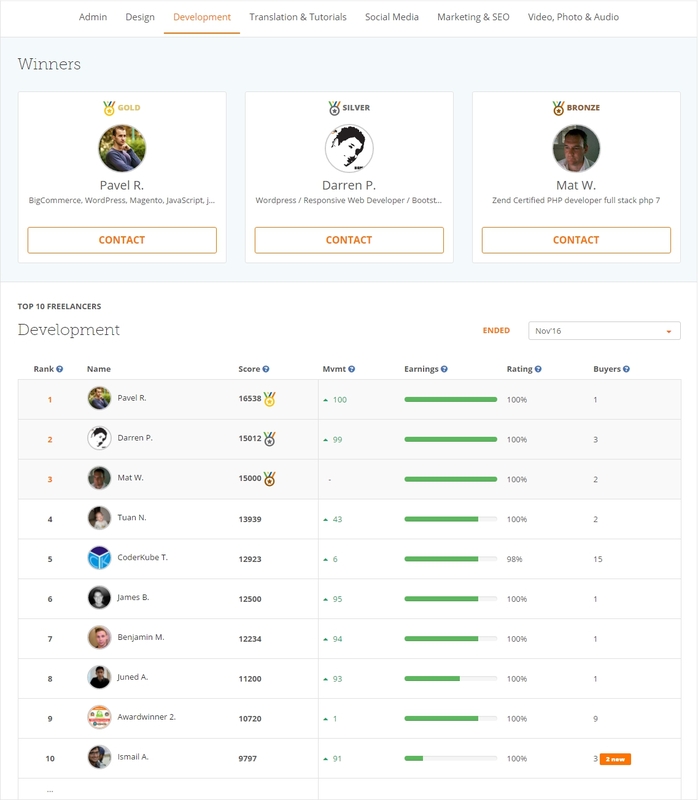 ~ Points displayed on the leaderboard are based on your monthly earnings, feedback rating and more. ~ If the average feedback rating of the invoices you raised is less than 90% you are not eligible to appear on the leaderboard for that month. ~ The earnings depicted on the leaderboard are attributed to your selected primary category (you can always change your primary category via the “Settings” menu option) and include only invoices that have received feedback rating from the Buyer. ~ Refunds will be penalised and have a negative effect on the total number of points. ~ Sellers who invoice new Buyers they invited to work on the platform will receive three times more points on the first rated invoice they issue. What do you think about our new initiative? Please leave your comments and ideas in the comments section below! – I would like to see my score even if I am in on the TOP10. – Freelancers should know the formula that generates the score. The required amount to reach TOP10 in homepage is a good metric, but I think a more complete explanation would be great. While these features are great, I think that PPH has to fix first things that trouble many freelancers like the search results of hourlies as I have described in another blog post. Potentially skewed so very easily – I’m about to have my best month ever on PPH, but because they’re all existing clients and it’s a case of invoicing after a stretch of work rather being awarded a job, I’m treated to a sadface and told how I’m slacking! I would really like that Our Freelancer Standing should be displayed in our Profile as well. So when a potential buyer sees our profile they may see where we stand. Not sure why, but I am in a category that I am not even selling in. Why is this? None of my sales are being recorded against the category it shows me at >100 in so it is going to prove pretty impossible to move up the standings! Anyway to hide it? being able to minimize it would be nice as it takes up a lot of space. It’s not representational of success. I’ve had more new customers in a month than these people, but have earned less probably due to the nature of the work. To me, level of success should be based upon the amount of new custom attained which is surely harder than repeat work from trusted clients. I’m consistently in the top 35 on PPH but it is interesting to see (when broken down into sectors) how I am ranked. I’m a TOP CERT freelancer yet am only in position 52. I am very worried that this is going to impact negatively upon my potential sales. Also, I am a copywriter but there is no COPYWRITING or WRITING category so where are we? If you have bulked us in with Marketing & SEO that is not accurate nor fair. At the moment, I am very disappointed with this new system as it seems to be ranking quantity above quality. This blatantly favours groups rather than individuals. How do you expect a freelancer to bring in as much revenue as a content marketing agency with 10 employees? And then it’ll boost their sales rather than the freelancer, meaning freelancers get stiffed and in time, all you have left will be agencies. I also note I’m listed in the wrong category.I quite clearly work in “Marketing & SEO” but am listed under “Development”. I’ve sent a support request to see how it can be changed–I’ll post the outcome of that here. LOL, I’m greeted with a sad face every morning now because I’m not considered active enough to be anything other than ‘slacking’ – Thanks for that PPH! I would like to make quite good efforts for standing 🙂 It’s ultimately a sign that newbies will be ignored or have very less chance to win jobs. How this will be helpful to “all” sellers here. Hope equality will be measured in transparent way for all who bids on jobs. There will be a way of funnel where someone can justify his skills as newbie to stand or hold the profile in starting stage. You guys have done a Great work. right now it’s very long process to remove 500+ notifications .. Or can you add Mark/Unmark system in Notification page ? Yes, good idea. I love the concept! My main issue is that showing this to buyers may well impinge heavily on sellers who are not in the top 10 of their category. Buyers will possibly pick someone from that top elite section and ignore the 90% of sellers not up there yet. In that case, it’s a true reflection of society today – the rich get richer and the rest don’t. I quite like it. It gives me a bit of motivation and is easy to understand. I am not a company of ten, it is just little old me working really very hard and I have reached number 7 in my category, so if I can do it, sure everyone else can. It can be a lonely world freelancing, and this seems to be a nice reward and something to aim for. Good Idea. Although I would same its to generalized for for certain categories. There is people who are in the Top 10 that do not do the same as me and vice versa. Would be good if there was an overall one and then maybe a filtered version, i.e. Ui / Ux, 3d design, logo designs, etc. PPH, you really have got a little confused here – perhaps you’ve been watching too much Strictly-Maggot-Eating-X-whatever? This is not a “fun” competition – it’s a business. WE – the sellers – are paying YOU. We are your clients. Why on earth would you rank your clients in order of which ones you think are the best, then let them know??! Very nice and motivational feature, keep it up. Another part timer PPHer here who would like to be rewarded for her good work – even if there is less of it. I will just ignore the ratings. it has never made that much difference to me. But the attachment issue is a big one. I think I have missed a couple of jobs because they couldn’t see my examples I attached. Don’t make changes without making it very clear what you are doing! You need to concentrate on keeping your sellers happy before trying new things fix old things first for example having invoices for over a week pending is just ridiculous even after the client leaves feedback I have spoke with fellow sellers here and they feel the same your going to push us away as we getting paid ridiculous time after the invoice got accepted. Nice motivational feature indeed. but also some meaningful awards will always motivate people. Can you clarify whether this is hourlies as well as jobs won? As the total amount for my sales in incorrect. I’ve actually taken 4 times the amount stated on the leadership board….. I hope you don’t plagiarise in your work! I suppose I should be flattered that you copy/pasted most of my comment and put your name to it, but I really would suggest that you write your own next time! I’m careful what I post here now – I’ve seen a comment I left on a past blog pasted word-for-word on the internet as a ‘motivational’ article! Thank you very much for your great and valuable feedback! We have already made some improvements as per your suggestions and have also updated the “Seller Tips” section of the blog post in order for it to be more informative.The leaderboard page was created in order to promote some healthy competition between freelancers and also act as a means of motivation. We will continue to improve the functionality of this and other features by taking into consideration the suggestions made by you! Another divisive scheme that will favour larger teams rather than the core group of sellers that make up the majority of PPH freelancers. It’s a complete misnomer to describe teams of people as ‘freelancers’. The management team don’t use their slack time very well if this is what they come up with. Not working well for me I’m afraid – the number one ranking in ‘Admin’ at the moment is an Architect with 1 sale which got a feedback rating of 90%. The number two ranking, who is actually working in admin, has had 9 sales, has 100% rating, but is lower. It doesn’t make sense that this should happen just because the Architect has labelled himself Admin and done 1 high priced job in a month. I’m an AdWords specialist, and grouped along with SEO. Sadly, when clients look for any AdWords help, they land up in the hands of these SEO freelancers who offer AdWords services as an add-on. How unfair the system can be. Anyways, the buyers would eventually learn the hard way and come back to us. Dear PPH, please understand SEM and categorise us separately. Erm – I’m in Admin? Nothing I do is Admin, development yes – how do you change categories? Woah! First of December and we start all of over again. Despite working my way up into the top 50 last month, I’m relegated to 101 on the first of the month. I assume everyone is the same, so the leaderboard makes no sense for clients who want to assess freelancers at the beginning of the month, or freelancers who haven’t received their first payment of the month yet. 2. Giving us the option to REMOVE it from our homepage? I don’t want to see a “ranking” that has no basis in reality every time I open PPH. Please. Just a little “x” option that takes it away would be nice. Personally I don’t think its anyone’s business on what another person earns. I don’t mind if its about amount of jobs but I think other freelancers money should not be in this even if it is just a bar and not a figure. 2nd Feb and still no improvements made to this totally pointless feature! I’m still in a category with Lawyers, Accountants, Business Consultants etc and still being told I’m not doing well. Last month my earnings didn’t actually tally up with what it said on the Leaderboard so not sure when it’s updated during the month.